"[T]he way we design, produce, and use clothes has drawbacks that are becoming increasingly clear. The textiles system operates in an almost completely linear way: large amounts of non-renewable resources are extracted to produce clothes that are often used for only a short time, after which the materials are mostly sent to landfill or incinerated. 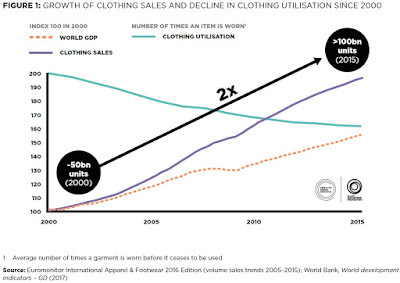 More than USD 500 billion of value is lost every year due to clothing underutilisation and the lack of recycling. Furthermore, this take-make-dispose model has numerous negative environmental and societal impacts. For instance, total greenhouse gas emissions from textiles production, at 1.2 billion tonnes annually, are more than those of all international flights and maritime shipping combined. Hazardous substances affect the health of both textile workers and wearers of clothes, and they escape into the environment. When washed, some garments release plastic microfibres, of which around half a million tonnes every year contribute to ocean pollution – 16 times more than plastic microbeads from cosmetics. Trends point to these negative impacts rising inexorably ..."
never ending up as waste." Sales in the textile industry are growing rapidly as world incomes rise, and as people expand their wardrobes and wear each fewer times. "Large amounts of nonrenewable resources are extracted to produce clothes that are often used for only a short period,4 after which the materials are largely lost to landfill or incineration. It is estimated that more than half of fast fashion produced is disposed of in under a year. 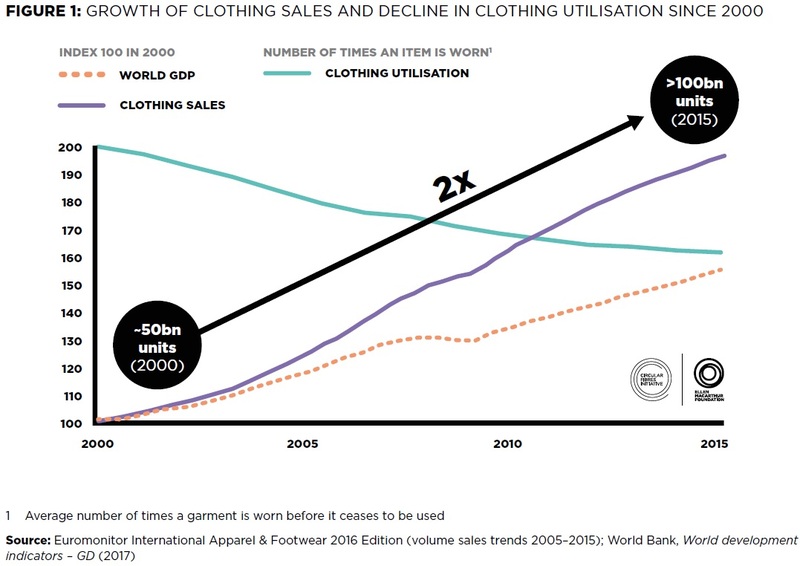 ..."
"Worldwide, clothing utilisation – the average number of times a garment is worn before it ceases to be used – has decreased by 36% compared to 15 years ago. 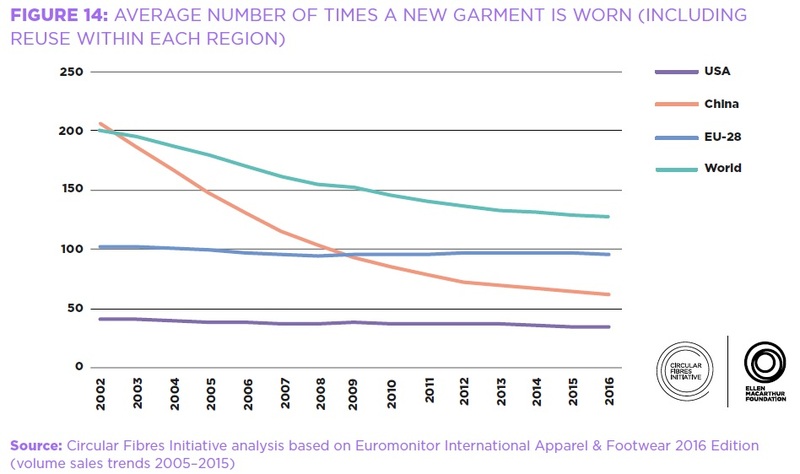 While many low-income countries have a relatively high rate of clothing utilisation, elsewhere rates are much lower. In the US, for example, clothes are only worn for around a quarter of the global average. 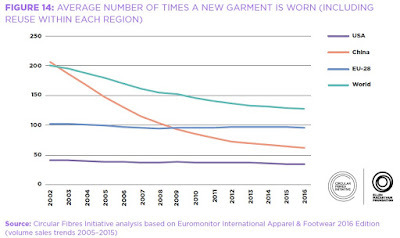 The same pattern is emerging in China, where clothing utilisation has decreased by 70% over the last 15 years. Globally, customers miss out on USD 460 billion of value each year by throwing away clothes that they could continue to wear, and some garments are estimated to be discarded after just seven to ten wears. ..."
clothing and household textiles each year is approximately GBP 82 million (USD 108 million). Across the industry, only 13% of the total material input is in some way recycled after clothing use ..."
"The textiles industry relies mostly on non-renewable resources – 98 million tonnes in total per year – including oil to produce synthetic fibres, fertilisers to grow cotton, and chemicals to produce, dye, and finish fibres and textiles. Textiles production (including cotton farming) also uses around 93 billion cubic metres of water annually, contributing to problems in some water-scarce regions. ... [I]t is recognised that textile production discharges high volumes of water containing hazardous chemicals into the environment. As an example, 20% of industrial water pollution globally is attributable to the dyeing and treatment of textiles. ..."
Much of the report is given over to discussion of four broad areas in changes could be made, with numerous examples of what is happening in each area: "1. Phase out substances of concern and microfibre release; 2. Transform the way clothes are designed, sold, and used to break free from their increasingly disposable nature; 3. Radically improve recycling by transforming clothing design, collection, and reprocessing; 4. Make effective use of resources and move to renewable inputs." "Subscription models allow customers to pay a flat monthly service fee to have a fixed number of garments on loan at any one time. These models can provide an attractive offering for customers desiring frequent changes of outfit, as well as an appealing business case for retailers. ... Subscription models are already disrupting the market, with brands such as Le Tote, Gwynnie Bee, Kleiderei, and YCloset. This demonstrates that there is a willingness to pay monthly subscriptions for clothing, with YCloset in China securing a USD 20 million investment to scale up in March 2017. Another successful model is Rent the Runway, initially set up for online short-term rental of clothing for occasion wear and high-end luxury garments, which expanded to include a monthly rental subscription model in 2016. ... YCloset is riding the wave of popularity for sharing economy services in China, gaining customers in over 100 Chinese cities since their app launched in 2015. They target mid-market urban customers who want to access variety and a fresh look, but who lack the budget to buy midrange or luxury clothing. ..."
recycling, and they are working on increasing this number. 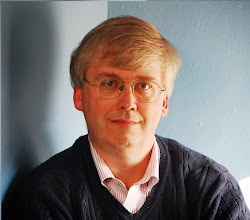 Similar services have emerged in other countries, for example Tale Me in Belgium. Subscription services have also been introduced for pregnant women through companies such as Borrow For Your Bump, attempting to better address a woman’s needs for maternity wear. ..."
"Houdini Sportswear has offered customers the option to rent their outdoor sports shells since 2013. This creates an attractive financial model for both the brand and the customer, who can afford high-quality performance sportswear for one weekend or week for 10–25% of its retail price, rather than buying a cheaper, low-quality version or needing to store the garment for the rest of the year. At the same time, Houdini achieves higher overall margins by combining rental and resale. ..."
The report especially appealed to me for a couple of reasons. One is that I tend to think of textiles as an important but rather sleepy industry, gradually being transformed by robots and automated production. The report persuaded me that the opportunities for innovation in textiles are far greater than I had imagined. Also, it seems to me that even among those who drive hybrid cars and recycle religiously, the environment effects of clothing choices are often not much considered. This report should help to open up a new dimension of environmental awareness. For a different angle on these issues, see "Quandaries of Global Trade in Secondhand Clothing" (May 22, 2015).